A tour enables PTZ camera to automatically move from one pre-configured position to the next in a predetermined order. The viewing time between one position and the next is configurable. Different tours also can be set up and activated during different times of the day. In the NVR Control Center — Cameras select a PTZ camera from the Cameras List and switch to the Tour — Setup Tour — connection will be established. If connection failed reconnect by clicking the Reconnect button. Press Add button below the tours list and enter Tour Name when asked — the name appears in the list. Enter Pan, Tilt, Zoom values or select a preset position from Preset drop-down list and press Goto Preset/PTZ button (no value equal 0). To add new position to the tour — click the Add button below the positions list and enter Stay in this position for (sec) when asked — the name appears in the list (position will be named based on the defined settings). If more than 2 positions were added the Build Loop button activates. Click the Build Loop button to add backward camera positions to the tour. Click the Test Tour/Stop Tour toggle button to test new tour (click once more to stop). Press Save button below the tours list to save the tour. After one or more tours were configured for the camera you can also schedule what tours (if any) should be activated during different days of the week and times of the day. 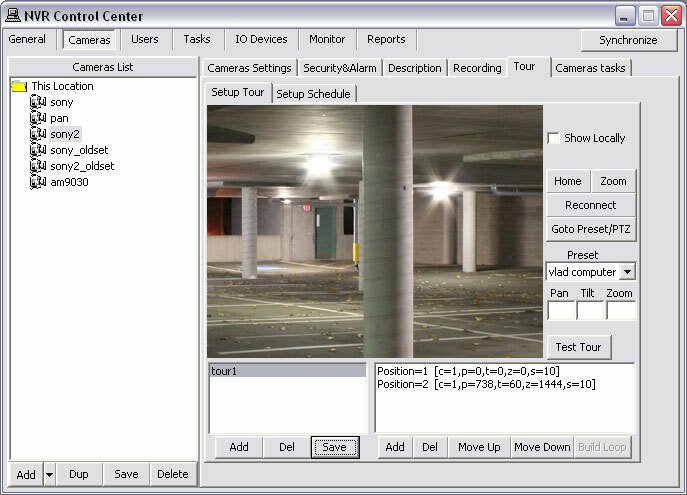 In the NVR Control Center — Cameras select a PTZ camera from the Cameras List and switch to the Tour — Setup Schedule. Press Add button below the schedules list to add a new schedule. Select the Restricted Between radio button and define a time range FROM - TO and leave proper days of the week checked to have the tour repeated these days only. Select a predefined tour from the Tour drop-down list the schedule will be applied to. Check Use locally (without Proxy) checkbox to connect to the camera using local IP address/port number during touring (optional). Press Save button below the schedules list to save the schedule. Repeat the steps to add more schedules.